The current Music Director of the Boston Pops Orchestra is Keith Lockhart. Fiedler conducting for the NBC Radio program Boston Pops Orchestra. In 1881, Henry Lee Higginson, the founder of the Boston Symphony Orchestra, wrote of his wish to present in Boston "concerts of a lighter kind of music". The Boston Pops Orchestra was founded to present this kind of music to the public, with the first concert performed in 1885. Called the "Promenade Concerts" until 1900, these performances combined light classical music, tunes from the current hits of the musical theater, and an occasional novelty number. Allowing for some changes of taste over the course of a century, the early programs were remarkably similar to the Boston Pops programs of today. The Boston Pops Orchestra had seventeen conductors before 1930, when Arthur Fiedler began a fifty-year tenure as the Pops conductor. Under Fiedler's direction, the orchestra's popularity spread far beyond the city of Boston through recordings, radio and television. Unhappy with the reputation of classical music as being solely for affluent concertgoers, Fiedler made efforts to bring classical music to a wider audience. He instituted a series of free concerts at the Hatch Shell on the Esplanade, a public park beside the Charles River. Fiedler insisted that the Pops Orchestra play popular music as well as well-known classical pieces, opening up a new niche of popular symphonic music. Of the many musical pieces created for the orchestra, the Pops' most identifiable works were the colorful novelty numbers composed by Fiedler's close friend Leroy Anderson, including "Sleigh Ride", "The Typewriter", "The Syncopated Clock" and several others. Fiedler also initiated what has become a Boston tradition, and keeps growing as the years go by, which is the annual "Holiday Pops" concerts the Boston Pops give every December. Under Fiedler's direction, the Boston Pops sold more commercial recordings than any other orchestra in the world, with total sales of albums, singles, tapes, and cassettes exceeding $50 million. The orchestra's first recordings were made in July 1935 for RCA Victor, including the first complete recording of George Gershwin's Rhapsody in Blue. The Pops made their first high-fidelity recording on June 20, 1947, of Gaîté Parisienne (based on the music of Jacques Offenbach), and recorded the same music seven years later in stereophonic sound, their first venture in multitrack recording. Fiedler is also credited with having begun the annual tradition of the Fourth of July Pops concert and fireworks display on the Esplanade, one of the best-attended Independence Day celebrations in the country with estimated crowds of 200,000–500,000 people. Also during Fiedler's tenure, the Pops and local public television station WGBH developed a series of weekly televised broadcasts recorded during the Pops' regular season in Symphony Hall, Evening at Pops. The list of artist-performers during this period includes world-class soloists and contains some historic and legendary names who performed on the many Boston Pops tours that went to hundreds of cities across the country throughout the 1950s through the 1970s. Some shows have holiday–oriented themes, such as Christmas shows featuring performers such as Jonathan Meath, who appeared as Santa with the Boston Pops for ten shows during 2008–2009. After Fiedler's death in 1979, he was succeeded as conductor of the Boston Pops by the noted film composer John Williams. Williams continued the Pops' tradition of bringing classical music to a wider audiences, initiating the annual "Pops-on-the-Heights" concerts at Boston College and adding his own library of well-known film scores (including Star Wars and Indiana Jones) to the orchestra's repertoire. During his time with the Pops, Williams had the honor of performing with Sammy Davis, Jr. as one of the artists for one of the Evening at Pops specials that aired on 1988. In 1991, the orchestra played Bill Monroe's Uncle Pen and other bluegrass classics with Ricky Skaggs and the Kentucky Thunder. Keith Lockhart assumed the post of principal Pops conductor in 1995. Lockhart continues to conduct the Boston Pops today. Williams remains the Laureate Conductor of the Pops and conducts a week of Pops concerts every year, two nights at Symphony Hall each spring and two nights at the Ozawa Hall in Tanglewood each summer. Lockhart has brought in numerous pop-music acts and icons in addition to Broadway greats to play with the orchestra since being named conductor, including Ben Folds, Rockapella, Guster, My Morning Jacket, Aimee Mann, Kelly Clarkson, and Elvis Costello. Glee star Matthew Morrison performed with the orchestra as did Frank Sinatra impersonator Steve Lippia during the 2012 Pops Spring Season. Lippia paid tribute to both greats Frank Sinatra and Tony Bennett by performing "Luck Be A Lady" by Frank Loesser (from Loesser's musical Guys and Dolls) and "I Left My Heart in San Francisco." During the 2014 Pops Spring Season, the orchestra worked with Jason Alexander (who opened the season that year), Warren Haynes in a "Jerry Garcia Symphonic Celebration," the debut of "Cirque de la Symphonie" featuring Cirque du Soleil performers, Billy Porter, Leonard Nimoy, The Hot Sardines, Jennifer Holliday and Melissa Etheridge. During the 2014 spring season, the orchestra also introduced the "Film with Orchestra" series beginning with The Wizard of Oz. During the 2015 Pops Spring Season, the orchestra worked with Bernadette Peters (who opened the spring season that year), The Midtown Men, and Audra McDonald. In 2015, the film that was chosen for the "Film with Orchestra" series was Singin' In The Rain. The orchestra also had tributes throughout the season: two nights of the orchestra playing the music of The Beatles; the ever-popular "John Williams Film Night"; a Celtic sojourn hosted by Brian O'Donnovan with Carlos Núñez and Karan Casey as the special guests; the ever-popular "Gospel Night at Pops" conducted by Charles Floyd featuring The Blind Boys of Alabama; the return of "Cirque de la Symphonie" featuring Cirque du Soleil performers; and ending with Simply Sondheim, featuring Marin Mazzie, Jason Danieley and the Tanglewood Music Center Fellows as special guests. During the 2017 Pops Spring Season, the orchestra had its first season-long tribute to a composer, that composer being John Williams. 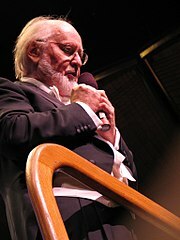 They recorded a new CD, Lights, Camera, Music: Six Decades of John Williams, which was released during the season. The orchestra had two pre-season events which marked the first time the orchestra had ever used Symphony Hall before May: "Celebrating John Williams!" and "E.T. in Concert." The Pops opened the season with Queen Latifah, and went on to host such events as "Mamma Mia! Mother's Day with the Music of ABBA," working with Ben Folds, "Gospel Night" in its 25th anniversary with Floyd and the Boston Pops Gospel Choir; Leslie Odom, Jr. in his orchestral debut after starring in Hamilton: An American Musical; performing a tribute to The Beatles with Larry "Cha-Chi" Loprete as the host; "Parting with The B-52s," and giving the world premiere of Sondheim on Sondheim with Philip Boykin, Carmen Cusak, Gabriel Ebert, and Lisa Howard as the vocalists. During the 2018 Pops Spring season, the orchestra worked with both Leslie Odom, Jr. and Andy Grammar (who opened the spring season that year) for the second time, as well as Sutton Foster again, who performed "A Broadway Celebration" with the orchestra. Some highlights of the season were the return of Laureate Conductor and legendary film composer John Williams for his annual "Film Night" appearances, in addition to an Opening Night salute to Leonard Bernstein for the occasion of Bernstein's centennial later that year. In addition to celebrating Bernstein's centennial, the orchestra presented concert versions of both On The Town and "West Side Story In Concert". They "Danced to the Movies," and were joined by tenor Alfie Boe who "Rocked the Pops" with them. The Pops were joined by Ashely Brown, Josh Strickland, Alton Fitzgerald White and Merle Dandridge to perform beloved songs from 9 Tony Award-winning and Academy Award-winning scores to "Disney's Broadway Hits." The orchestra also performed "The Best of the Boston Pops" Concerts, a series that hadn't been featured since 2013. The Pops performed their annual "Gospel Night" with the Boston Pops Gospel Choir and guest star Melinda Doolittle under the direction of Charles Floyd. The orchestra also welcomed back Leslie Odom, Jr. with special guests Renee Elise Goldsberry and Phillipa Soo for "An Evening with Leslie Odom, Jr."
For the 2002 Fireworks Spectacular, the orchestra performed with Maureen McGovern, who paid tribute to the centennial of legendary and iconic Broadway composer Richard Rodgers by performing "My Favorite Things" (from The Sound of Music), and Barry Manilow, who paid tribute to and acknowledged the September 11 attacks when performing his 1976 hit "Weekend in New England". For the 2005 Fireworks Spectacular, the orchestra performed with Big and Rich (who performed their hit "Love Train"), Gretchen Wilson, and Cowboy Troy (who performed with Big and Rich for a new rendition of the Declaration of Independence), and highlighted their newest CD America by performing "The Star-Spangled Banner", "Armed Forces Salute", "This Is My Country", "The Gettysburg Address" (narrated by then-WBZ-TV news anchor Jack Williams), "Doodletown Fifers" (performed with the Middlesex County Volunteers Fifes & Drums), "God Bless America", "Boogie Woogie Bugle Boy", the "Main Title" (from Star Wars), Tchaikovsky's famous "1812 Overture", and John Philip Sousa's classic march, "The Stars and Stripes Forever." For the 2006 Fireworks Spectacular, the orchestra performed with Aerosmith, who performed "Dream On" and "I Don't Want to Miss a Thing." For the 2008 Fireworks Spectacular, the orchestra performed with Rascal Flatts, who performed "Life Is A Highway" and "Every Day." For the 2009 Fireworks Spectacular, the orchestra performed with Neil Diamond, who performed "Sweet Caroline", "Forever in Blue Jeans", "Cracklin' Rosie", and "America". During the 2010 Fireworks Spectacular, the orchestra celebrated its 125th season and the Hatch Shell celebrated its 100th anniversary. The orchestra performed with Toby Keith, who performed "Courtesy of the Red, White and Blue" and "American Soldier". They also performed with the Tanglewood Festival Chorus, Renese King (who sang "We the People" (the theme song for Visions of America)), and they performed "The Dream Lives On: A Portrait of the Kennedy Brothers", with Lisa Hughes, Jack Williams, Jeremiah Kissel and Will LeBow. The Pops specifically commissioned the piece by Peter Boyer and Lynn Ahrens to be used during their 125th season. For the 2014 Fireworks Spectacular, the orchestra performed with Julia Udine and Ben Jacoby from the 2014 U.S. touring production of Andrew Lloyd Webber's musical The Phantom of the Opera, and The Beach Boys, who performed "Fun, Fun, Fun", "Good Vibrations", and "Surfin' USA". For the 2015 Fireworks Spectacular, Lockhart and the Pops performed with Michael Cavanaugh, Sons of Serendip, and members of the United States Show Troupe. For the 2016 Fireworks Spectacular, Lockhart and the Pops performed with pop stars Demi Lovato, Nick Jonas (both performing on their joint world tour the FutureNow Tour), and Grammy- and CMA-winning country music stars Little Big Town. The 2016 Fireworks Spectacular also marked David Mugar's final Fireworks Spectacular show, which he produced for over 40 years. In October 2016, the Boston Pops agreed to take over the management of the annual July Fourth fireworks concert on the Esplanade and to take on the responsibility for finding a corporate sponsor for the $2 million cost. On March 7, 2017, it was announced that Eaton Vance and Bloomberg L.P. had been signed on as sponsors of the concert under a three-year deal, and that the telecast of the event would move from WBZ-TV/CBS to Bloomberg Television. For the 2017 Fireworks Spectacular, Lockhart and the Pops performed with actor Leslie Odom Jr. (of Hamilton: An American Musical fame), 1990s pop singer Melissa Etheridge, and pop singer Andy Grammer, in addition to the United States Army Soldier's Chorus. For the 2018 Fireworks Spectacular, the orchestra worked with Rachel Platten, Rhiannon Giddens, the Indigo Girls, actress Rita Moreno, Natalie Cortez (who was about to open in the ensemble in the world premiere of Moulin Rouge!, which is slated to open on Broadway in 2019) and the Tanglewood Festival Chorus under the direction of James Burton. In addition to Bloomberg nationwide, the show was carried by independent station WHDH (channel 7) locally over-the-air, and online at Boston.com, BostonGlobe.com, bso.org (the Boston Symphony Orchestra's website), and on the Boston Pops Fireworks Spectacular app. POPSearch is the Boston Pops' nationwide talent competition that offers amateur singers the chance to perform with the orchestra at Boston's Fourth of July Extravaganza, as well as on the orchestra's national tour. The winner also receives a cash prize. The American Idol–style competition has expanded into a nationwide contest through video submissions on YouTube and voting through BostonPops.org. Tracy Silva, a mother of two from Taunton, Mass., and van driver for special needs children, won the inaugural POPSearch contest in 2004. Frances Botelho-Hoeg, an elementary school principal from Kingston, Massachusetts, was knocked out in the second round of the inaugural POPSearch, but returned in 2005 to sweep the competition. The POPSearch 2007 grand champion Maria Perry won $5,000 and performed with the Boston Pops on July 3 and 4 in the annual July 4 Extravaganza seen by a live audience of almost a half-million people on the Charles River Esplanade and several million more on WBZ-TV. In the early spring of 2008, Keith Lockhart announced the "Boston Pops High School Sing-Off--A Best of Broadway Challenge," the first-ever Boston Pops musical theater competition for Massachusetts high school students. Students from high schools throughout Massachusetts were encouraged to submit audition videos of musical theater vocal works for solo, duet, trio, quartet, or quintet to the Boston Pops before May 9, 2008. The winner was featured in the Fourth of July concert on the Esplanade. ^ BSO Opening Night Program Guide, 2011, pp. 18-19; Boston Pops Holiday Program Guide 2011, p. 15. ^ Edward B. Colby (Dec 3, 2009). "Town in the spirit: Dedham Square to be filled with song, shopping". Dedham Transcript. Archived from the original on 2011-07-21. Retrieved 2010-11-13. ^ David Powell (21 November 2007). "Ricky Skaggs and the Boston Pops: "Uncle Pen"" – via YouTube. ^ David Powell (20 November 2007). "Ricky Skaggs and the Boston Pops: "Highway 40 Blues"" – via YouTube. ^ Leung, Shirley (2016-10-03). "A new era for Independence Day concert on the Esplanade". The Boston Globe. Retrieved 2016-10-04. ^ "Vance, Bloomberg new forces for Fourth of July concert". Boston Herald. Retrieved 2017-07-03. ^ "How to watch, stream, or listen to the 2017 Boston Pops Fireworks Spectacular". Boston.com. 2017-07-03. Retrieved 2017-07-03. ^ "7News partners with Bloomberg TV to air 2018 Boston Pops Fireworks Spectacular". WHDH. 21 June 2018. Retrieved 22 June 2018. ^ Midgette, Anne (April 2, 2003). "Harry Ellis Dickson, 94, Violinist and Conductor in Boston". The New York Times.